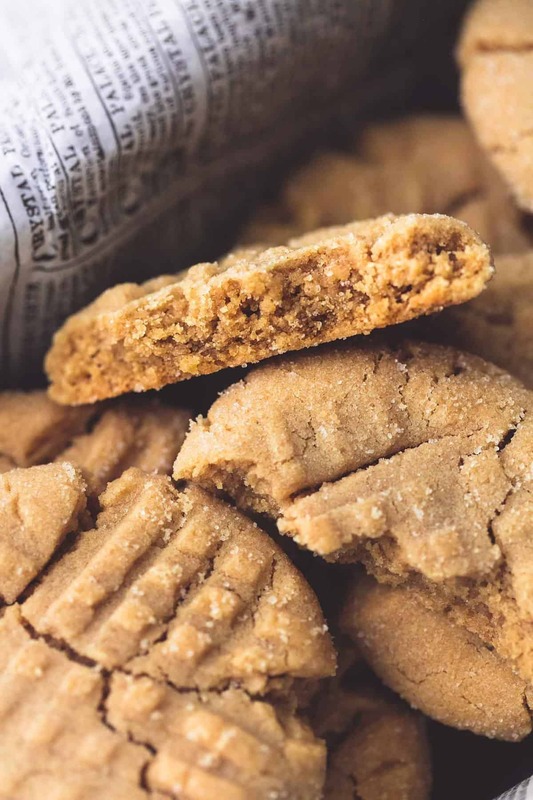 These are THE Best Super Soft Peanut Butter Cookies! 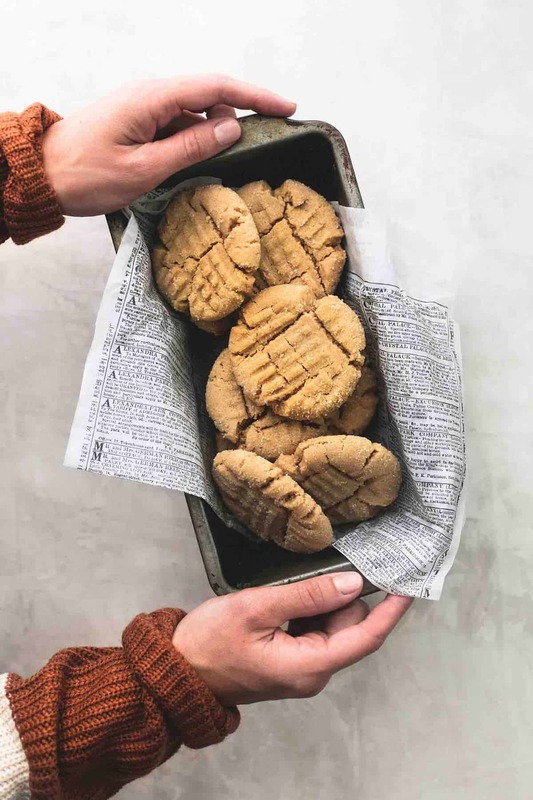 Sink your teeth into that perfectly soft and chewy texture and you’ll see why these are the only peanut butter cookies you’ll ever need! 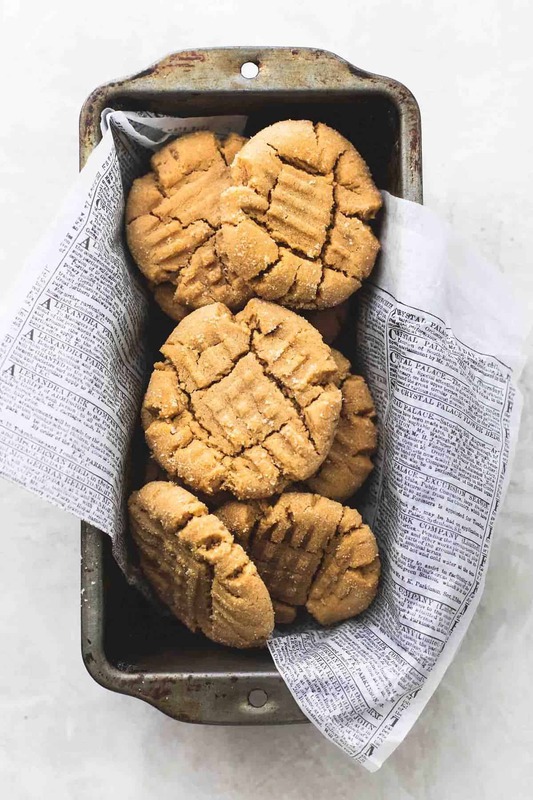 Looking for another delicious dessert after devouring these Best Super Soft Peanut Butter Cookies? You’ll also love Salted Caramel Stuffed Double Chocolate Cookies and Cookie Butter Chocolate Chip Cookies. If you feel like the title of these cookies is filled to the brim with hyperbole, well, I’m sorry to say it, but you’d be wrong. These are the BEST most SUPER SOFT peanut butter cookies in the whole entire universe. You can try to prove me wrong. All that would take is for you to bring me all the peanut butter cookies you can find. Then I’d have to do a taste test and eat all the cookies, and I just don’t see how I could lose here, no matter what. 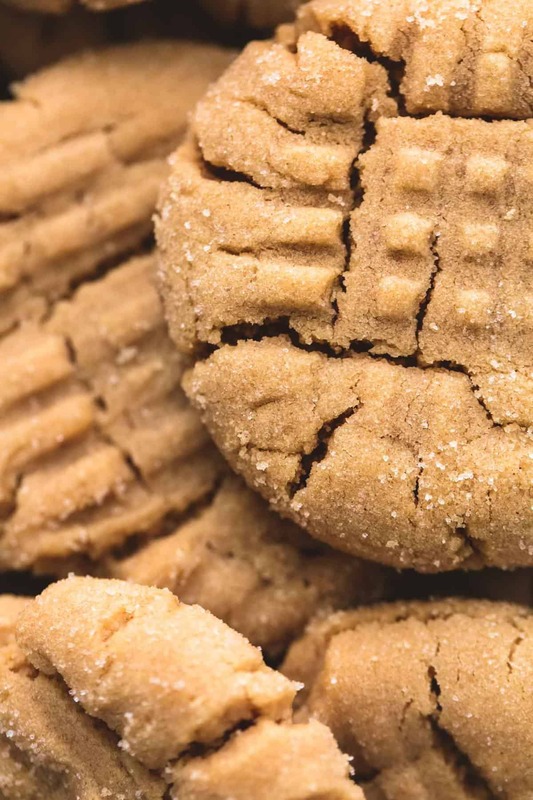 But seriously, I do think there is no point in making a peanut butter cookie if it’s not all the things in one — soft, chewy, peanut buttery, sweet but not too sweet — and these just check all the boxes. And, I don’t know if you’ve realized it or not, but I kind of have a little crush on peanut butter. Especially when it comes to sweets. Sure, I’ve made all the peanut butter things, but had yet to perfect the original peanut butter cookie. Till now. I considered not sharing this recipe and keeping it all to myself. But, then I thought, how rude of me, and wouldn’t you love to make these, too? Yes, yes you would. I think what makes these so soft is a few things: the butter at room temperature, adding the dry ingredients to the wet, the gentle handling of the dough, and, maybe most importantly, the not overbaking of the cookie. You have to watch these bad boys like a hawk. And — this is also important — take them off the cookie sheet to cool after a minute or two. If you leave them on the cookie sheet they will keep baking. This is no bueno. Cook them too long either in or out of the oven, and you’re going to have a hard, sad cookie. Then I’ll be one sad cookie for you. Why Are My Cookies Crumbling? This is a great question, and one I get asked a lot. (It happens to me more often than I’d like to admit.) The main reason you have a crumbly cookie is because you’ve added too much flour. You might think the dough looks too wet when you mix it, so you think, “I’ll just add a little flour and see.” But this just results in a crumbly cookie. Other reasons you might have a crumbly cookie is that you’ve used margarine or another butter substitute or you’ve cooked them too long. Sorry, but you just can’t get these soft, delicious cookies without using real, unsalted butter. And you have to make sure to not overcook them — and that includes on the sheet afterwards. Watch your time and remove them to cool fully on a cooling rack a minute or two after they come out of the oven. Don’t wait — I promise this is an important step. What Other Desserts Can I Make With These Soft Peanut Butter Cookies? Take two equal-sized cookies and add a scoop of softened ice cream in the middle, wrap in plastic wrap, and freeze for a perfect peanut butter ice cream sandwich. Almost any ice cream could work here, especially if it had chocolate in it. Crumble peanut butter cookies on top of ice cream with some hot fudge, whipped cream, and a cherry for a yummy sundae topping. Use the cookie dough as a base for a peanut butter pie. Cook the dough in the pie pan first though, then add the ingredients for the pie (ingredients are no-bake). Add crumbled pretzel bits, mini chocolate chips (or both!) to the dough for salty/sweet combination. 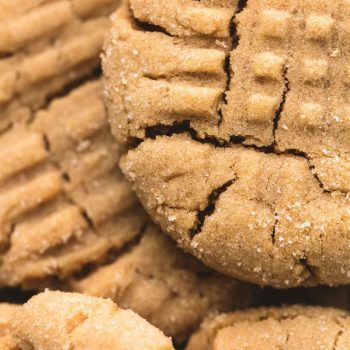 These are THE Best Super Soft Peanut Butter Cookies! 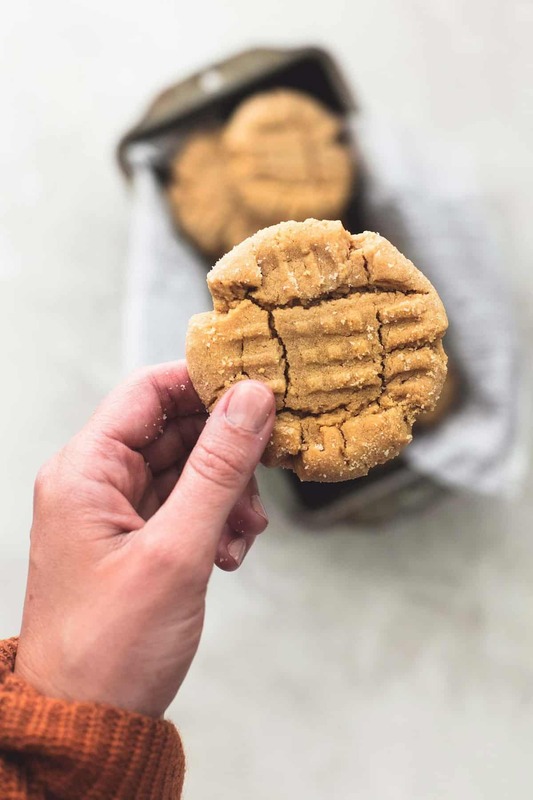 Sink your teeth into that perfectly soft and chewy texture and you'll see why these are the only peanut butter cookies you'll ever need! Preheat oven to 350 degrees and very lightly grease a baking sheet or line with a baking mat. In a large bowl cream together butter, peanut butter, brown sugar, and 1/4 cup granulated sugar for 2-3 minutes until light and fluffy. Mix in egg and vanilla until blended. Roll cookie dough balls in remaining 2 tablespoons sugar, then place on baking sheet 2-3 inches apart. Use a fork to gently press a criss-cross pattern into each cookie dough ball, only pressing ball down about half way. Bake for 8-9 minutes - DO NOT OVER BAKE. The cookies should just begin to crack on top. Allow to cool 1-2 minutes on baking sheet, then transfer to a cooling rack. Store in an airtight container at room temperature up to 5 days (they are softest on day 1 and 2!). Cookie dough slightly adapted from Ahead of Thyme. Other Cookie Recipes You'll Enjoy! I don’t see peanut butter in the ingredients list? How much do we use? Hi! These look amazing but you forgot to add the peanut butter to the ingredieNt list so i’m wondering how much? Thanks! HOW MUCH pEANUT BUTTER? DOESNT SHOW ON PAGE EVEN WHEN I HIT TO PRINT RECIPE?? I only had about 1/2 of the peanut butter I needed, so I added 1/2 almond butter. They turned out great. Great job!! Thanks for your feedback! Super excited to hear that they still turned out so delicious! Yum! I am going to give thes e a tre! These cookies are delicious but i wonder is 3TBS too big? I only got 14 cookies and had to cook longer? They wereNt as thick ( maybe i pressed too much with the fork) and werent cracked? I will def try again as they tasted good and were still very chewy! Hi Ardina- The cookies need to be pretty thick to stay soft and chewy- I recommend not pressing down as far with the fork! are you asking us if you only got 14 cookies, and if your cookies weren’t cracked, or telling us? Question marks indicate a question. They are not used to end sentences, even if you are confused or uncertain. Flour is definitely important in helping these cookies to not be flat. I just made these last night. There were good, but didn’t seem to have much of a peanut butter taste. Instead they tasted vaguely Of flour. I may have another go at it with more peanut butter. Thanks for your feedback, Ashely! I’d love to hear your thoughts with round two! If the amount of flour matters, can you give the amount needed in ounces or grams? You are hilarious, Barb! I’ll join that taste test adventure ANY day, haha. Way to go! Sounds like you did an awesome job. I do recommend not smashing the cookies down much with the fork! Dang- sounds like your husband did a great job! Thanks for your feedback, Marissa! 1 1/2 C flour doesn’t seem to be enough. I baked these and they never set up. Sorry to hear that you didn’t have great success with this recipe! Not sure what has gone wrong with yours- I haven’t had that issue! Three batches?! I’ll be right over! 😉 Super excited to hear that you and your family love this recipe! Thanks, Anna! You are 100% right. These are the best peanut butter cookies I have ever had! So delicious. Thank you. I can stop looking further. Yessss! Your comment has made my day- they are totally my go-to cookie lately! 3T making 14 balls.they still aren’t done after 13 mins…trying 3 more mins. Frustrating. Please tell how many you make for such little time. Thanks. I’m anxious to compare this recipe to the one I use. It sounds good and I plan to try it. One suggestion i have that may be affecting some of you is Evelation. Depending on whether you live at sea level or at a high elevation the same recipe can act differently. Slight adjustments to the amount of flour, sugar and baking time should correct any of the issues you are experiencing and give you great results. Just Google for instructions. Good luck! Hi Nancy- I have not tried this recipe with almond flour so I can’t say for sure! I don’t have much experience baking with almond flour, sorry! I am excited to hear that you two enjoyed these cookies so much, Tracy 🙂 Thanks!